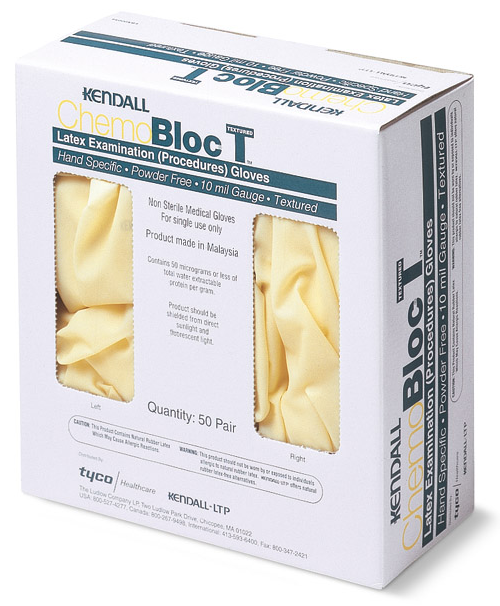 ChemoBlocT™ Latex Chemotherapy Gloves are 10 mil thick at the fingertips. These heavy duty latex gloves have textured fingertips to provide extra gripping power. Designed as hand specific gloves, these durable latex gloves are designed to reduce fatigue and are ideal for chemotherapy compounding, administration and other related chemotherapy activities requiring protection for your hands. Manufactured by Covidien, ChemoBlocT Latex Gloves offer protection for hands and wrists. 10 mil thickness at fingertips. Provides sensitivity while maintaining safety. Textured fingertips for better gripping. Hand specific design reduces fatigue commonly associated with ambidextrous gloves. Powder free with beaded cuff that resists tearing. Meets ASTM guidelines for chemotherapy gloves. Added security and protection while complying with NIOSH, ONS and ASHP recommendations for chemotherapy gloves. 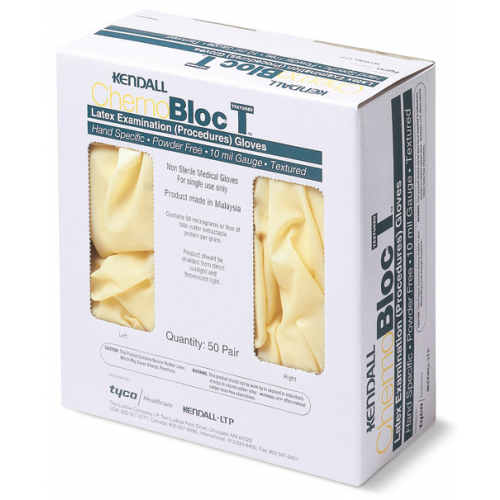 ChemoBlocT™ Latex Chemotherapy Gloves Product Numbers: CT5055G, CT5056G. Fingertip Thickness: 0.25 mm/10 mil.